PetFinder.my - New Main Page! 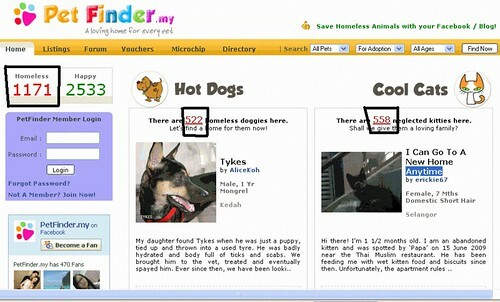 To welcome the new year of 2010, we have revamped the main page of PetFinder.my to provide a more dynamic feel and generate better exposure for all our homeless pets! Now when you visit the main page, you can immediately see a showcase of dogs and cats with basic info when you move your mouse over the photos. If you want to see more random profiles, feel free to click on the "I'm Feeling Lucky" button. We will also be featuring well written articles at our main page - so be sure to share useful tips and knowledge at the forum! If you have not noticed yet, there's now a Facebook Fan window at the left sidebar as well, which shows how many fans our PetFinder.my Facebook Application currently has. If you have not added our application yet, don't forget to do so, where you can instantly feature homeless animals within your Facebook profile! Also, while you are browsing a pet profile at our site, you can now instantly share it with your friends on Facebook, Blogger, MySpace etc by clicking on the corresponding Share icons at the top of the page. We will continue to introduce more enhancements to improve the efficiency of our system, so our members, and most importantly our beloved furry companions, derive the greatest benefit from community. Please let us know should you come across any bugs, thanks! Last edited by AndyKoh; 12-16-2009 at 06:55 PM. Re: PetFinder.my - New Main Page! If you have not noticed yet, there's now a Facebook Fan window at the left sidebar as well, which shows how many fans our PetFinder.my Facebook Application currently has. If you have not added our application yet, don't forget to do so, where you can instantly feature homeless animals within your Facebook profile! walawei!! total revamp man!!! haha.. I was shocked coz last night it was still the same..
Last edited by kairul; 12-17-2009 at 12:30 AM. Thanks, hopefully it would encourage more activity and provide improved showcasing for our little furry friends. More enhancements to come soon! You're observant hehe.. do you know why it's not synchronized? Because you overlooked our other little furry friends.. such as rabbits and hamsters! Thanks for reminding me bout our other furry little friends..
am I an observant? Well, maybe.. hehe..
Last edited by kairul; 12-17-2009 at 01:10 AM. Andy,though my senior citizen eyes was a little bit dancing around before I can finally see the whole thing, I must say I like the new face of PF. Haha.. June, yours are still big, strong and sharp eyes, not senior citizen's! As well as a powerful tongue... else how to win the "Most Talkative Forumer" award? Just notice something new up today! Haha... you are fast, Babyzee! Not sleepy yet so I'm fast as I can be.. It's good for the exposure on the listing section as we can also be foruming here and also looking on the adoption section...It's great!